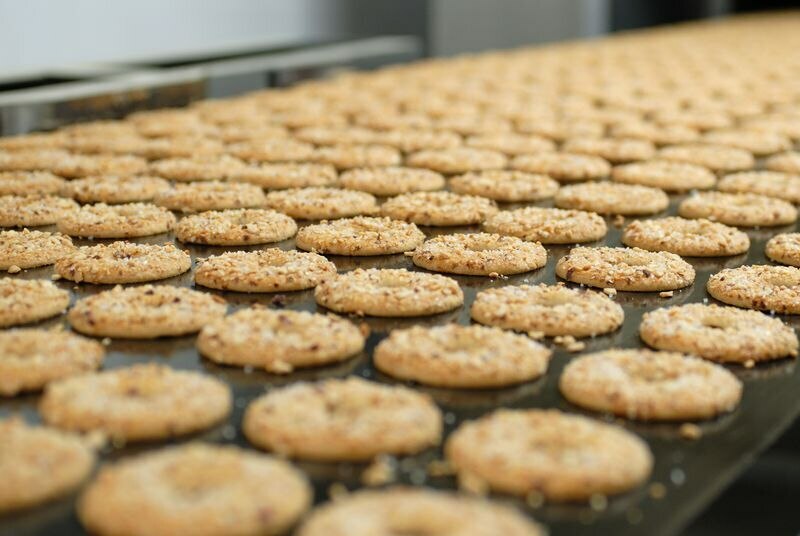 Bakery lines Machinery Manufacturer in Coimbatore Biscuits lines Production line for making pastries, cookies, biscuits enables baking a large volume of assortment in one line, we advise you to consult all your demand with our experts. omplete standard line consists of the following equipment: flour silos, mixing plant with flour, water and ingredients dosing, forming device with extruder, or shaping roller, device for sprinkling, baking band oven, dipping and glazing equipment, cooling and transport conveyors, packing machine. here most of the used technologies of these days, such as string and pressing-out forming devices, hybrid or cyclotherm oven controlled by PLC, and the latest fully automated robotic Workstation for reloading baked pastry pieces from cooling conveyor to package machine.